Rules were meant to be broken! I had a rule- a rule about blogging. I wasn't going to allow myself to blog unless my housework was done for the day- HA! What I (quickly) found out, is that my housework is NEVER done!!! I can work & work & work, & turn around- & there is more to do! So I have a different outlook now- the housework is going to be there- it will wait for me. My memory will not. If I go too long without blogging about our weekends, daily lives, fun moments, etc.- it leaves my brain- it does not wait. And I want to capture our memories- not have them leave on me. So there. My blogging for today is justified. I'm not going to feel bad about that basket of laundry staring at me, pratically begging to be folded & put away. It's already Tuesday, but I really want to share our weekend! 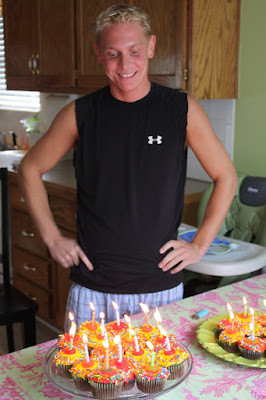 The little bro turned the big 2-5 (yay! lower insurance!) & we celebrated him all day Saturday! He requested that I cook(which was flattering)- so I did, & we enjoyed the day with my side of the family. We ate, watched a movie, played Wii, & of course ate some more! It was a fun day! I forgot how much of a blaze 25 lit candles make- haha! We are so proud of my brother & the man he is growing into. He has had more than his share of struggles in his life. To see him where he is now blesses us tremendously, & we are thankful for his life & how far he has come! He has the biggest, kindest, softest heart, & though I'm the big sister- I wish Icould be more like him. HAPPY BIRTHDAY to my favorite brother! We love you & could not be more proud of you! Sunday, we rounded up for church- let me just say, Satan works extra hard on Sundays to keep us from making it to church. Jett is a pretty scheduled kid. I can guesstimate how things are going to go from day to day (for the most part). But not on Sundays. His schedule is ALWAYS "off" on Sundays- which throws our schedule "off"- which sends me into a complete tizzy. I like things to flow- to go as planned- & on Sundays the plan/schedule/flow simply does not exist. It is so frustrating! It would be so much easier to just stay home! But then I get to church, & hear the message, & know EXACTLY why it's hard to get to there- because I NEED to be there to hear the message, & Satan knows it! We are so blessed to have such a wonderful church - one where the word of God is preached, & where the people feel like family. It was an empowering message about loving others, & both Jared & I left feeling refreshed, rejuvenated, & ready to show the love of Christ to others! After church, we came home, ate leftovers, & put Jett down for his nap. Jared & I seized the opportunity to cozy up on the couch to catch a couple zzzz's ourselves. Jett slept for almost 3 hours, & we appreciated that! To quote Jared, "It has been 6 months since we've had a nap!" He was super excited!! We ended the day with a trip to the park. 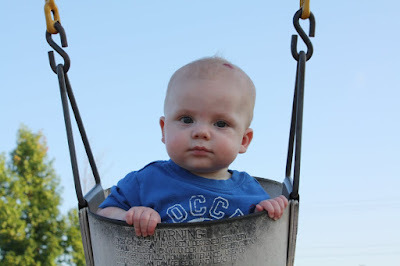 It was a beautiful evening, & we spent it pushing Jett in the baby swings & chatting with some other couples we met there. 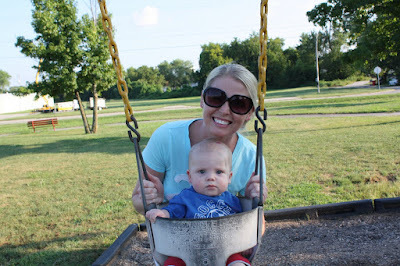 Jett absolutely loved swinging & watching all of the other kids play! 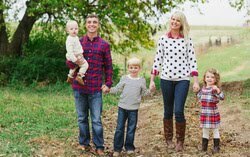 It is so much fun spending time as a family- there is nothing I'd rather be doing! It was a fabulous weekend! Simple, but full. Full of fun, love, & laughter! It doesn't get better than that! 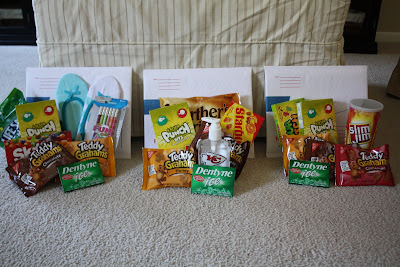 Yesterday I did manage to put together some care packages to send off to some of our favorite college kids :) Jared & I were involved in the Youth Ministry at our church prior to having Jett, & this year a few of the kids that we got to see come in as Freshmen in High School are walking out to be Freshmen in college! While we are so proud of them, it is a little bittersweet watching them grow up & leave. They aren't our children, but their parents have graciously shared them with us over the past 4 years, & we love them like they are our own! I will miss the slumber parties, the brutal honesty, & even the occasional phone calls that would wake us at 2 a.m. My thoughts & prayers go out this week to those parents, who have raised their children from babies, & are now watching them leave their "nests" to go out into the world as adults. In the blink of an eye, I know I will be where they are, & I will need the same prayers (tear). It has been an honor to be a part of their lives, & we are excited to see what God has planned for each of them! 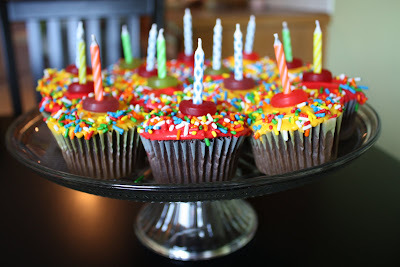 And today, (while DaddyBoy entertained Jett) I managed to bake cupcakes for my little bro's birthday! We will be celebrating tomorrow with family here at our house! I was really hoping to make the cupcakes from scratch, but just ran out of time & ended up with a box mix :/ The frosting is home-made, though- that counts for something, right?! Well, that's a few of our "happenings" for now! Have a great weekend! I was happy to see that he had gained so well- the pumping is paying off! Dr. Moylan also informed us that Jett's motor skills are very developed, & it will be a very short time before he is crawling- WHAT?!?! But, I'm not ready for him to be all grown up & mobile!!! He said to go ahead & start "baby proofing" the house...so a trip to Babies R Us for gates, outlet covers, cabinet locks, & whatever else we can find is in our near future. We will lower the crib tonight & I will probably cry. Can you imagine what I'll be like on the first day of Kindergarten? Yikes. Gosh, I love that little boy so much, & thank the Lord that he has given us such a happy, healthy baby! Shout out to my sweet hubby! Our weekend was really fun- it included spending a day with my Aunt Vera learning to sew curtains, a trip to Pittsburg (& down memory lane) to hang with my brother, & lots of family, fun, & good laughs. What it did not include, was- sleep. To make a long story short- Jett did not sleep at all on Saturday night. We were up with him literally ALL night. I am not sure what went wrong, but he hasn't slept that terrible since we brought the kid home from the hospital. Needless to say, I was not a happy mama. In fact, I remember saying around 4:40 a.m. "I don't think I'm cut out for this." I regretted feeling that way as soon as the words left my mouth- but man, oh, man...it was a rough night. Needless to say, I was exhausted on Sunday. When I don't get enough sleep (or any sleep in this case), I get physically ill- dizzy, naseous, terrible headaches, earaches, sore throat- weird.bad.stuff. Top that with a heavy dose of crabby & cranky, & it ain't pretty, lol. My poor husband...I hope he gets a special crown in Heaven for putting up with me! On our way home on Sunday, Jared informed me that he would be taking a PTO day on Monday so he could give me a break & let me catch up on some rest. Bless his heart! So yesterday, I got an hour & a half nap, spent the entire day in my jammies, spent too much time on facebook, ordered Chinese take-out for dinner, & barely left the couch! Jared & Jett ran some "guy" errands, played outside, & enjoyed the day together. I am telling you- it was AMAZING! I feel so refreshed today, & so thankful for a husband that loves me so much! I am spoiled rotten & blessed beyond measure. Thank you so much for my day of rest & relaxation! It was exactly what I needed! I am so thankful & blessed to have a husband who takes such good care of me! You have the kindest, most giving heart of anyone I have ever known, & I couldn't go through this life without you. I love you so much! You are the best husband a gal could dream of (& it doesn't hurt that you're pretty cute, too ;) !!!! 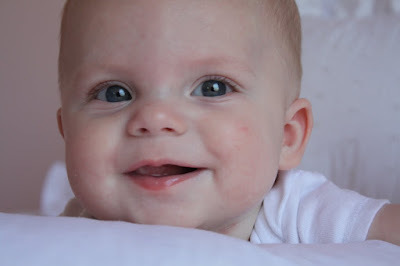 Oh my goodness...has it really been almost 2 months since I've blogged?! Geesh! Obviously, life is in full swing here in our household! This mommy thing is keeping me busy-& I love it! 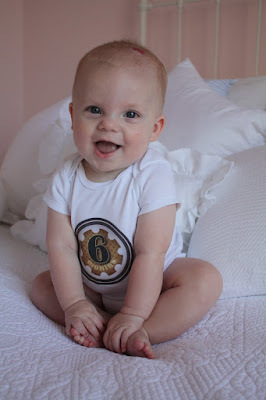 The latest news around here is that our little Jett man turned 6 months old August 1st! SIX MONTHS- I cannot believe it. He is getting such a personality, & is doing something new each & every day. He is growing so big, & while I grieve the fact that my baby isn't staying little, I also embrace the changes & fun we are having every single day! It goes by in a blink of an eye, & is the most fun I've ever had! 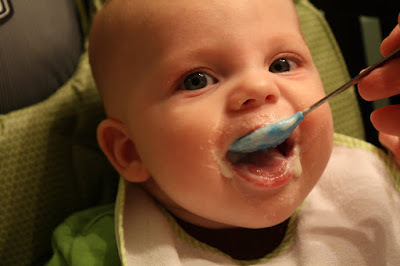 *At 5 months, we started Rice Cereal- he LOVED it! *He is rolling over like crazy, but sometimes gets "stuck" on his belly- a quick "flip-over" from Mom or Dad, & we're good to go! 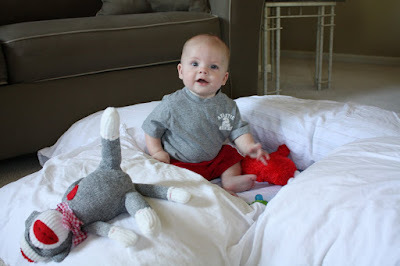 *He is sitting up on his own- that seemed to happen overnight. He occasionally will fall over, but is pretty solid most of the time. *My newest favorite thing that he does- reaches for us! It is so sweet! He first reached for Jared when I was holding him. Now he will go back & forth between the two of us, & it just melts my heart! 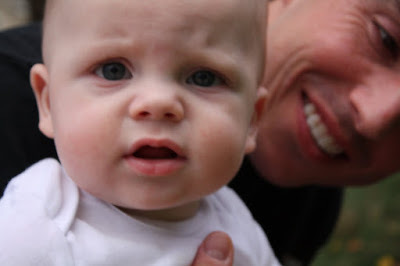 *He FREAKS out when he catches sight of his bottle! I mean total meltdown like he is starving- have you seen his chubby legs? He's NOT starving, lol! 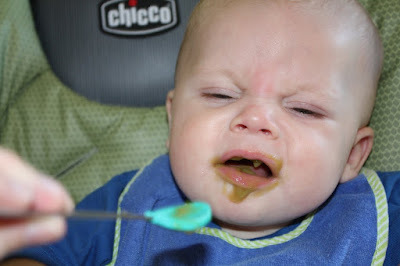 *At 6 months, we started his first baby food- we tried green beans. 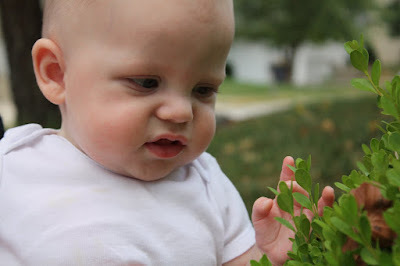 He wasn't so sure at first- but after a gag, some shivers, & a few funny faces, he decided green beans are yummo! We are going to try carrots next week! I am sure there is so much that I am missing- hence the reason why I should NEVER go this long without blogging again! I am so mad at myself. It just seemed that the summer FLEW by, & we were so busy having fun that I didn't stop to document it all, which I already regret. I will do better. I will do better. I will do better. Well, here are a few pics!